Beautiful, colourful and always welcoming to visitors, Marrakech is a magical place to visit. The city can be separated into two halves: the ancient walled Medina, a jumble of crooked streets and venders selling their fares, and colonial Ville Nouvelle with its glitz and glamour. 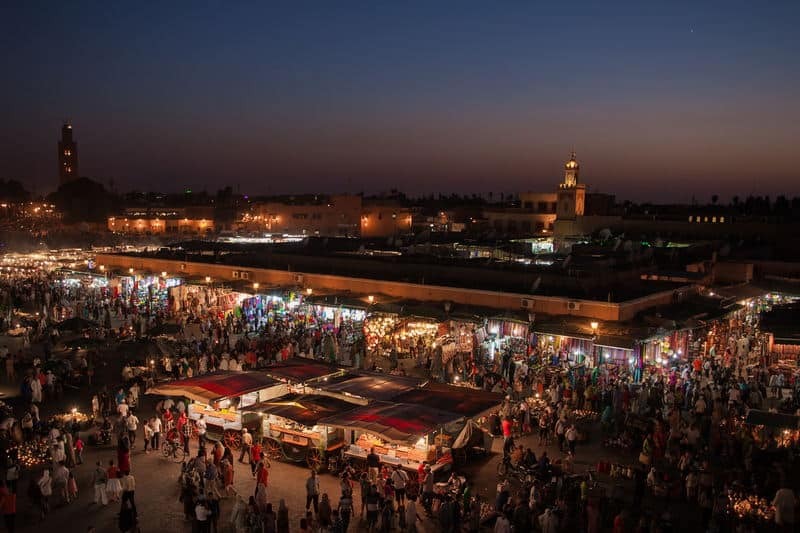 From the many markets, to exceptional attractions, such as Jemaa el Fna and the Saadian Tombs, it’s impossible to resist the charms of Marrakech. One of the (many) places to visit in Morocco’s fourth-largest city, is, of course, Jemaa el Fna; a bustling city square. By day, it’s a great place to people watch, but by night it plays to host to a number of open-air restaurants, serving local dishes. Be sure to wander through the food stalls and watch the entertainers around the square. A trip to Marrakech wouldn’t be complete without visiting the exceptional Jardin Majorelle. A 12 acre botanical garden designed by the French artist James Majorelle in the 1920s and 1930s, it was opened to the public in 1947 and is home to plants from five different continents. Discovered in 1917, the Saadian Tombs date back to the 16th century, and are the final resting place of 60 members of the Saadian Dynasty. Famed for its stunning decor, including Italian Carrara marble pillars and plasterwork brushed with pure gold, the Saadian Tombs must be seen to be believed. Food lovers are in their element in Marrakech. If you’re a first time visitor to the city, you must, must try the street food. Not sure what to have? Then have a food adventure! Experiment with tagines (a traditional Moroccan slow cooked dish of meat and vegetables named after the vessel it is cooked in), mint tea, harira soup (a tomato and lentil soup), and even steamed snails! For those feeling less adventurous, familiar items like freshly cooked fish, kebabs and vegetables are plentiful. Pick up snacks and sweets as you wander through the medina. There are plenty of stalls selling nuts, dried fruit, and sweet treats for you to nibble on. To warn off pushy food stall owners, just say that you just ate and you’re full. As with traveling to any destination, it pays to be safe in Marrakech. Grab the business card of your hostel so you have an address in case you get lost (and you will get lost in the twisting streets!). When in doubt jump in a registered taxi to get where you need to go. Have a nearby hotel or cafe call for one. Ladies should take particular care in what you wear so not to offend the local culture. It’s important to cover your shoulders and knees. Opt for modest, loose and flow-y pieces of clothing. Great options are maxi skirts which keep you covered and cool at the same time. Resist the urge to wear short shorts and sleeveless tanks – you’re going to draw a lot of attention. Bring a scarf as well to help keep you warm during the cool evenings and to help cover up if you go into a mosque. Haggling isn’t just accepted in Marrakech, it’s encouraged! But, there are rules; remember, be confident, but don’t be too eager to settle early, and if you can’t get the bargain you want, walk away. You may even find a better bargain at another stall. It can be a little bit strange, especially coming from the Western world, but if you relax, you can almost enjoy it. 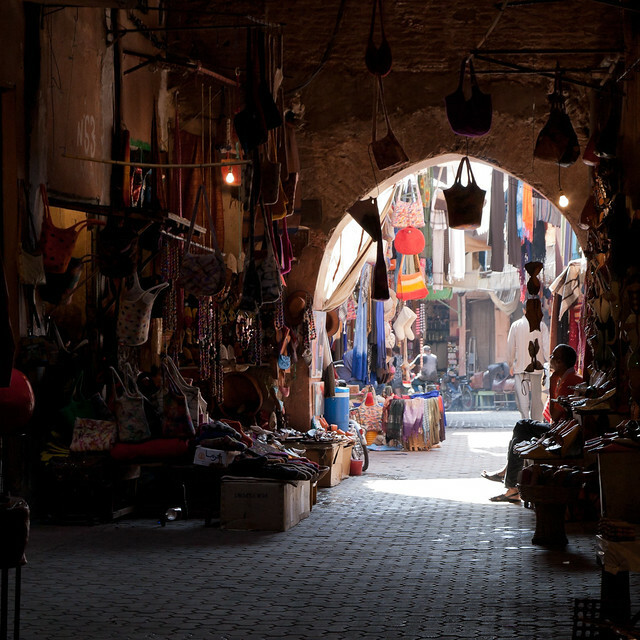 Marrakech is a cosmopolitan city with bags of old-school intrigue. But perhaps the greatest thing about Marrakech as a destination is that it’s great to visit all year round. While it will be busier and hotter in the summer, winter is also a great time to visit, just remember that it gets surprisingly cold after sunset. Have you been to Marrakech or Morocco? What advice would you give the first time visitor? Stay on top of my travel and food adventures by liking me on Facebook and following me on Twitter & Instagram. I was in Morocco earlier this year and I just didn’t love Marrakech. The food is completely amazing but other than that I much preferred the other towns I visited. I’ve actually heard that from various people. Maybe it’s all the chaos? Which ones did you like better? I reaaaaaally want to visit Morocco (and of course, Marrakech) someday! I imagine colorful street markets and just amazing culture. And the food sounds delicious! I would love to visit Morocco someday soon too. You’ve provided some great ways to enjoy a city I would love to explore, shop and eat. I have heard such wonderful things about the food too. I did enjoy my stay in Marrakech. I can understand why many people find Marrakesh too chaotic. I love it, but only for a few days then I want to travel outside into the mountains. The cities in the Anti Atlas mountains are very nice. Try out Tafraoute and Taroudant. Ooh, thanks for the tips! I’ll have to keep that in mind when I’m there next. 1) Try not to get too close to the attractions in Djema el Fna, especially if you’re taking pictures, unless you’re willing to leave tips. When taking pictures of stalls, try to be discreet – most vendors won’t be happy about it. 2) If you’re interested in exploring the the less-touristy parts of the medina, hire a guide. Ours took us through the back streets of the medina where you can find old caravanserais and watch artisans in their workshops. It is also quiet and peaceful, with hardly any tourists in sight. I’ve written some firsthand accounts on my blog (www.grumpycamel.com) about navigating the souks and dining at the food market. I love this city, however I can understand why some travellers have a different opinion about the place. Marrakech can be overwhelming, and personally I prefer the quiet Berber villages in the Atlas mountains. Thanks for these great tips Daniela.